Colin Kaepernick, meanwhile, is more than just an athlete or a football player at this point. His name alone generates visceral reactions from football fans and non-fans alike. There is no need for me to go into a deep dive on his personal politics and his continuing protests or his ongoing community outreach efforts. If you are reading this, you probably have a general understanding of who he is, for better or worse. Point being – you know who he is. Or at a minimum, you have heard about him. Thus, one thing is certain: Colin Kaepernick is a brand. He has a name that now has intrinsic value beyond sports. Through his protests and the attention it has generated, his image has also attained a measure of recognition by the consuming public. There is value in this. There are also trademark rights that attach from the commercial uses of his name and image. 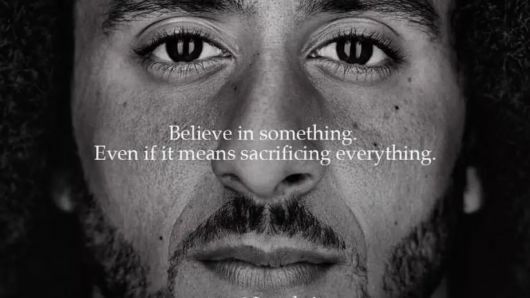 Kaepernick recently boosted his profile through a new Nike advertising campaign. This is highlighted by a commercial that began airing with the beginning of the new NFL season. Along with the meme-worthy image that preceded it. Though this expanded commercial presence, Kaepernick has rightfully explored protecting his name, his image, and his overall brand. The ESPN article referenced a recent filing with the USPTO. To be clear – this is not a “trademark application.” Nor did Kaepernick “file to trademark [an] image of his face, hair.” That is not how the process works or what a trademark is. There is no “process” for getting a trademark. Trademark rights exist upon use. The United States government does not grant or issue trademarks. The government only issues trademark registrations, which is different. You do not need a registration to enforce trademark rights (but it helps). This is the recent application Kaepernick’s company, Inked Flash, Inc., submitted to the USPTO. It is a Section 1B application, which is known as an “Intent to Use” application. In short, this means that Kaepernick either has or intends in the near future to use this particular image in commerce and that he is asserting ownership of this trademark (again: it is a trademark the moment he uses the image in commerce in the United States). What is impressive about this application is not the intent to commercially use his image. It is actually how many different ways he has expressed an intention of using this image. He filed one application, but for seventeen (17!) different classes of goods or services. Each class of goods has a filing fee of at least $225, which means the total filing fee was at least $3,825. Add in attorneys’ fees for handling this legal work and this is a serious document. The various classes cover everything from clothing and t-shirts (class 25) to lotions (? ), candles (?? ), pillow cases (???) and door mats (which sets up some all-too-easy jokes). This application does not state a particular date for use in commerce, which implies that he has not yet used the mark in commerce. When Kaepernick’s company does use the mark, the next step is to file a declaration of use with the USPTO establishing priority dating to whatever the first use in commerce is/was. Thus, this legal filing operates as a notice to the public of Kaepernick’s claim to trademarks and related rights. While I recognize that it is easy to colloquially refer to it as a “trademark application,” based on what we see (and have seen) from ESPN and Rovell’s reporting on trademarks, we can safely conclude that such a reductive description is dangerous and misleading. I try to avoid being lazy when I describe important legal issues. Colin Kaepernick last played a game in the NFL on January 1, 2017. There is a substantial possibility that he never suits up as an NFL player ever again. His career as an “athlete” may already be in the past. In contrast, his career as a spokesman and avatar for social projects appears to be his present and his future. That is why he is protecting his name and his image/likeness. He sees the value in his trademarks and he intends to establish and enforce all rights that may attach. These legal filings are merely the byproduct of that.